Boca Raton, Fla. – The Florida National University men’s tennis team was defeated by No. 5 Keiser men’s tennis team on Saturday afternoon at South County Regional Tennis Center. KU’s Geronimo Barrios & Lorenzo Villaume took down FNU’s Geronimo Vivero & Umberto Particelli in the first pairing of doubles by a score of 8-4. KU’s Riccardo Ferraris & Oliver Koeng defeated FNU’s Fabrizio Tormen & Franco Minoldo in the second doubles matchup 8-4. Geronimo Barrios (KU) defeated Geronimo Vivero (FNU) 6-2, 6-2. Anthony Popyrin (KU) defeated Umberto Particelli (FNU) 6-1, 6-4. Lorenzo Villaume (KU) defeated Fabrizio Tormen (FNU) 6-3, 6-3. Julian Turosienski (KU) defeated Tim Oppermann (FNU) 6-1, 6-2. 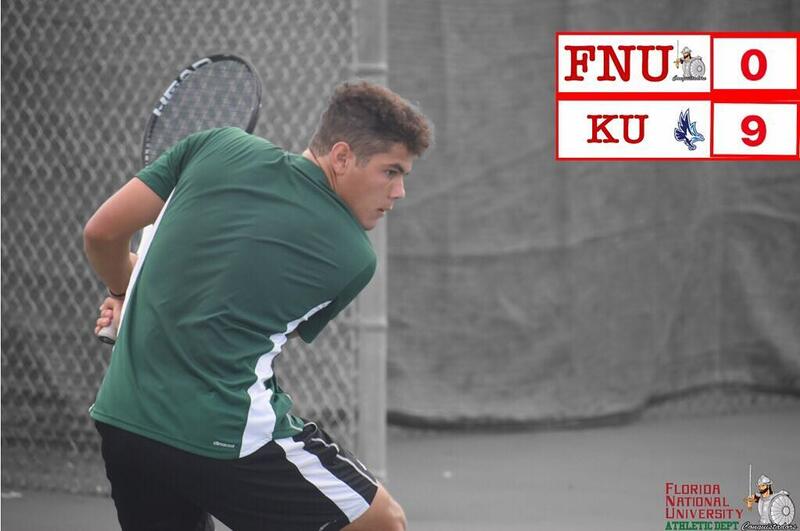 Arthur Bonnaud (KU) defeated Franco Minoldo (FNU) defeated 6-0,6-0. Gerard Rodriguez (KU) defeated Javier Godoy (FNU) 6-0, 6-0. The Conquistadors Men’s tennis team will face Saint Thomas University on Thursday, April 11th, at Saint Thomas University at 4:00 p.m.